As a friend of ours once said: Want to know if we're being welcomed home? Walk through Machaneh Yehudah! A people that has realized its right for self-determination and that lives in a state that gives expression to its identity sometimes forgets how life looks without realizing this right. Such people finds it difficult to remember how relevant this right – which is collective in essence – is for one’s personal life. Here’s a reminder taken from a biographical tale of a woman I never met. I saw her recorded testimonial at the Museum of the Jewish Diaspora in Tel Aviv. She described the feeling she experienced when she boarded an illegal immigration ship before Israel’s establishment, and spotted a sign reading “Entrance” above the door. An Israel-born individual may find it difficult to guess what is so touching here. Something symbolic perhaps? An entrance into a new world? A different future? An entrance into one’s home? No, none of the above. What amazed this woman and truly left her breathless, she said, was the public, functional usage of Hebrew. She never saw Hebrew letters of this size, that is, part of the public sphere. Up until that moment, Hebrew for her was a language written in small, private letters; an embarrassing text that must be hidden. This simple experience comprises a deep Zionist insight: There is no such thing as private self-determination. Privatizing identity undermines the individual, rather than liberate him. This is why the dreams of emancipation failed - because there is no such thing as being Jewish at your own home, and just a “regular person” in the outside world. If you cannot be Jewish upon leaving your home, it means you are not a free man. Part of the shift undergone by Israel’s elite from a world premised on values of solidarity to a world of individualist values manifests itself through the rejection of this deep insight. The new liberal elite offers us a different, privatized perception of identity. In its view, identity will not be shared by the collective, but rather, the opposite is true; a unique mixture each one of us will be formulating for ourselves. It will be a sort of colorful puzzle that each one of us creates privately. Yet this is no new freedom, but rather, old slavery. This is not a case of protecting the individual against collective tyranny, but rather, it is the ancient ban on Jews to step out from their homes as Jews. This is a case of going back to the emancipation that offered “Jews as individuals” everything while offering “Jews as a collective” nothing. Emancipation did not fail coincidently. It failed because it privatized what is in essence public; because it deprived people of what it seemingly gave them. It granted Jews partnership in the right for self-determination, as long as they don’t define themselves as they see fit. This entire mess can be undone via a small sign that reads “Entrance” in Hebrew. And not because of the metaphorical meaning seen by an Israeli-born person such as myself, but rather, because of the absence of such meaning; because for all of us it’s simple, functional, natural, and taken for granted that our public sphere needs to be managed in Hebrew. Gadi Taub is an Israeli author, historian, and op-ed columnist. 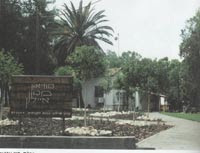 Giv’at Ha-Kibbutzim, near industrial park T.M.R. "With her and [Defense Minister Ehud] Barak you can make history," Sarkozy told Netanyahu, according to a Monday night report on Israel TV's Channel 2 News. "I have always accepted Israeli foreign ministers, and I loved to have Tzipi Livni here at the Elysee [Palace], but with [Lieberman] I can't." The French leader allegedly also made a dismissive hand gesture when mentioning the Israeli Foreign Minister. Livni, he added, made a strategic mistake in refusing to join Netanyahu's cabinet. Minister of National Infrastructure Uzi Landau, a leader in Lieberman's Israel Beiteinu party, reacted to the Channel 2 report on Tuesday morning in an interview on IDF Radio. "It's difficult for me to believe that a leader of a friendly country could make such remarks," Landau said, "but were I the Prime Minister, and such comments were made in my presence, I would bang on the table and object. That's how a prime minister should conduct himself to defend his country's honor." MK Ahmed Tibi of the Arab nationalist Ra'am-Ta'al party had a very different reaction. "The international community has started to absorb the danger of the fascism being taught by Lieberman," he said. And how would Nicolas Sarkozy answer someone similiar to MK Ahmed Tibi? If living in France bothers some people, they should feel free to leave a country they don't like. UMP meeting 22 April 2007. 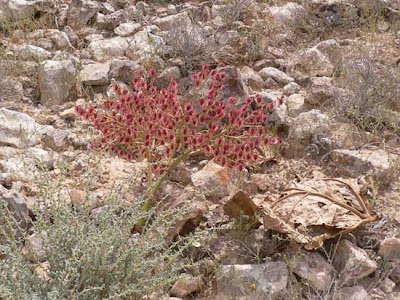 University of Haifa-Oranim have managed to make out the "self-irrigating"
of up to one meter. Prof. Simcha Lev-Yadun, Prof. Gidi Ne'eman and Prof.
resembles the habitat's mountainous topography. the ground only as deep as 1 cm. this manner," the researchers concluded. For a brief moment it seemed that US President Barack Obama was moved by the recent events in Iran. On Friday, he issued his harshest statement yet on the mullocracy's barbaric clampdown against its brave citizens who dared to demand freedom in the aftermath of June 12's stolen presidential elections. Speaking of the protesters Obama said, "Their bravery in the face of brutality is a testament to their enduring pursuit of justice. The violence perpetrated against them is outrageous. In spite of the government's efforts to keep the world from bearing witness to that violence, we see it and we condemn it." While some noted the oddity of Obama's attribution of the protesters' struggle to the "pursuit of justice," rather than the pursuit of freedom - which is what they are actually fighting for - most Iran watchers in Washington and beyond were satisfied with his statement. Alas, it was a false alarm. On Sunday Obama dispatched his surrogates - presidential adviser David Axelrod and UN Ambassador Susan Rice - to the morning talk shows to make clear that he has not allowed mere events to influence his policies. After paying lip service to the Iranian dissidents, Rice and Axelrod quickly cut to the chase. The Obama administration does not care about the Iranian people or their struggle with the theocratic totalitarians who repress them. Whether Iran is an Islamic revolutionary state dedicated to the overthrow of the world order or a liberal democracy dedicated to strengthening it, is none of the administration's business. Obama's emissaries wouldn't even admit that after stealing the election and killing hundreds of its own citizens, the regime is illegitimate. As Rice put it, "Legitimacy obviously is in the eyes of the people. And obviously the government's legitimacy has been called into question by the protests in the streets. But that's not the critical issue in terms of our dealings with Iran." No, whether an America-hating regime is legitimate or not is completely insignificant to the White House. All the Obama administration wants to do is go back to its plan to appease the mullahs into reaching an agreement about their nuclear aspirations. And for some yet-to-be-explained reason, Obama and his associates believe they can make this regime -- which as recently as Friday called for the mass murder of its own citizens, and as recently as Saturday blamed the US for the Iranian people's decision to rise up against the mullahs -- reach such an agreement. IN STAKING out a seemingly hard-nosed, unsentimental position on Iran, Obama and his advisers would have us believe that unlike their predecessors, they are foreign policy "realists." Unlike Jimmy Carter, who supported the America-hating mullahs against the America-supporting shah 30 years ago in the name of his moralistic post-Vietnam War aversion to American exceptionalism, Obama supports the America-hating mullahs against the America-supporting freedom protesters because all he cares about are "real"
So too, unlike George W. Bush, who openly supported Iran's pro-American democratic dissidents against the mullahs due to his belief that the advance of freedom in Iran and throughout the world promoted US national interests, Obama supports the anti-American mullahs who butcher these dissidents in the streets and abduct and imprison them by the thousands due to his "hard-nosed" belief that doing so will pave the way for a meeting of the minds with their oppressors. Yet Obama's policy is anything but realistic. By refusing to support the dissidents, he is not demonstrating that he is a realist. He is showing that he is immune to reality. He is so committed to appeasing the likes of Mahmoud Ahmadinejad and Ali Khamenei that he is incapable of responding to actual events, or even of taking them into account for anything other than fleeting media appearances meant to neutralize his critics. Rice and Axelrod demonstrated the administration's determination to eschew reality when they proclaimed that Ahmadinejad's "reelection" is immaterial. As they see it, appeasement isn't dead since it is Khamenei - whom they deferentially refer to as "the supreme leader" - who sets Iran's foreign policy. While Khamenei is inarguably the decision maker on foreign policy, his behavior since June 12 has shown that he is no moderate. Indeed, as his post-election Friday "sermon" 10 days ago demonstrated, he is a paranoid, delusional America-bashing tyrant. In that speech he called Americans "morons" and accused them of being the worst human-rights violators in the world, in part because of the Clinton administration's raid on the Branch Davidian compound in Waco, Texas in 1993.
events to influence its "hard-nosed" judgments. TAKE THE ADMINISTRATION'S response to the Honduran military coup on Sunday. While the term "military coup" has a lousy ring to it, the Honduran military ejected president Manuel Zelaya from office after he ignored a Supreme Court ruling backed by the Honduran Congress which barred him from holding a referendum this week that would have empowered him to endanger democracy. Taking a page out of his mentor Venezuelan dictator Hugo Chavez's playbook, Zelaya acted in contempt of his country's democratic institutions to move forward with his plan to empower himself to serve another term in office. To push forward with his illegal goal, Zelaya fired the army's chief of staff. And so, in an apparent bid to prevent Honduras from going the way of Daniel Ortega's Nicaragua and becoming yet another anti-American Venezuelan satellite, the military - backed by Congress and the Supreme Court - ejected Zelaya from office. And how did Obama respond? By seemingly siding with Zelaya against the democratic forces in Honduras who are fighting him. Obama said in a written statement: "I am deeply concerned by reports coming out of Honduras regarding the detention and expulsion of president Mel Zelaya." His apparent decision to side with an anti-American would-be dictator is unfortunately par for the course. As South and Central America come increasingly under the control of far-left America-hating dictators, as in Iran, Obama and his team have abandoned democratic dissidents in the hope of currying favor with anti-American thugs. As Mary Anastasia O'Grady has documented in *The Wall Street Journal*, Obama and Secretary of State Hillary Clinton have refused to say a word about democracy promotion in Latin America. Rather than speak of liberties and freedoms, Clinton and Obama have waxed poetic about social justice and diminishing the gaps between rich and poor. In a recent interview with the El Salvadoran media, Clinton said, "Some might say President Obama is left-of-center. And of course that means we are going to work well with countries that share our commitment to improving and enhancing the human potential." But not, apparently, enhancing human freedoms. FROM IRAN to Venezuela to Cuba, from Myanmar to North Korea to China, from Sudan to Afghanistan to Iraq to Russia to Syria to Saudi Arabia, the Obama administration has systematically taken human rights and democracy promotion off America's agenda. In their place, it has advocated "improving America's image," multilateralism and a moral relativism that either sees no distinction between dictators and their victims or deems the distinctions immaterial to the advancement of US interests. While Obama's supporters champion his "realist" policies as a welcome departure from the "cowboy diplomacy" of the Bush years, the fact of the matter is that in country after country, Obama's supposedly pragmatic and nonideological policy has either already failed - as it has in North Korea - or is in the process of failing. The only place where Obama may soon be able to point to a success is in his policy of coercing Israel to adopt his anti-Semitic demand to bar Jews from building homes in Jerusalem, Judea, and Samaria. According to media reports, Prime Minister Binyamin Netanyahu has authorized Defense Minister Ehud Barak to offer to freeze all settlement construction for three months during his visit to Washington this week. Of course, in the event that Obama has achieved his immediate goal of forcing Netanyahu to his knees, its accomplishment will hinder rather than advance his wider goal of achieving peace between Israel and its neighbors. Watching Obama strong-arm the US's closest ally in the region, the Palestinians and the neighboring Arab states have become convinced that there is no reason to make peace with the Jews. After all, Obama is demonstrating that he will deliver Israel without their having to so much as wink in the direction of peaceful coexistence. So if Obama's foreign policy has already failed or is in the process of failing throughout the world, why is he refusing to reassess it? Why, with blood running through the streets of Iran, is he still interested in appeasing the mullahs? Why, with Venezuela threatening to invade Honduras for Zelaya, is he siding with Zelaya against Honduran democrats? Why, with the Palestinians refusing to accept the Jewish people's right to self-determination, is he seeking to expel some 500,000 Jews from their homes in the interest of appeasing the Palestinians? Why, with North Korea threatening to attack the US with ballistic missiles, is he refusing to order the USS John McCain to interdict the suspected North Korean missile ship it has been trailing for the past two weeks? Why, when the Sudanese government continues to sponsor the murder of Darfuris, is the administration claiming that the genocide in Darfur has ended? The only reasonable answer to all of these questions is that far from being nonideological, Obama's foreign policy is the most ideologically driven since Carter's tenure in office. If when Obama came into office there was a question about whether he was a foreign policy pragmatist or an ideologue, his behavior in his first six months in office has dispelled all doubt. Obama is moved by a radical, anti-American ideology that motivates him to dismiss the importance of democracy and side with anti-American dictators against US allies. For his efforts, although he is causing the US to fail to secure its aims as he himself has defined them in arena after arena, he is successfully securing the support of the most radical, extreme leftist factions in American politics. Like Carter before him, Obama may succeed for a time in evading public scrutiny for his foreign-policy failures because the public will be too concerned with his domestic failures to notice them. But in the end, his slavish devotion to his radical ideological agenda will ensure that his failures reach a critical mass. And then they will sink him. Today's Golden Oldie is from July 1999. I came across this cartoon from ten years ago. It is NOT one of those cartoons "that I could do today." Back in 1999 Jewish Fundraising went through its predictable seasonal cycles. The cartoon displays an amazingly "all's well in the world" ho hum attitude that is almost shocking. Now, just ten years later we've had a market crash, an economic meltdown, and, as a poisoned cherry on top of the Ice Cream Sundae, we've had the Bernie Madoff Ponzi scheme ...which took out major Jewish philanthropies and major Jewish donors alike. So in this year of 2009 things are very different from 1999. For info on what's happening in the world of Jewish Philanthropy I always check with eJewishPhilanthropy.com. More than 400 English-speaking yeshiva students have recently completed an educational curriculum dealing with the Arab-Israeli conflict and titled, "Understanding, Advocating, and Inspiring." The program, which brings courses on the modern State of Israel and Israel advocacy into yeshiva classrooms, was created by The David Project in cooperation with MASA, and Taglit-Birthright. This year's graduating class is made up of gap year students, who will be able to bring their Jewish leadership experience to college campuses and speak up for Israel. The program has been implemented in sixteen yeshivot and seminaries across Israel. Rabbi Yamim Goldsmith, head of the Sha'alvim women's seminary told Ynet, "We are proud to teach our students a love for the Land of Israel and the State of Israel- an integral component of our girls' year in Israel. "Through its talented staff and advanced teaching techniques, The David Project reinforces those ideals, making them real and turning theory into practice". The 16-lesson curriculum is designed to combine history of the Arab-Israeli conflict with Zionism and leadership development. Executive director of the David Project Anna Kolodner explained, "The students' time in the country places them in a unique and opportune position to become effective, life long advocates for Israel… deepening the students' connection with Israel by educating them on Zionism and the Arab-Israeli conflict, and inspiring them to take leadership roles back home". David Project alumni Nava Friedman, a student from the Midreshet Nishmat seminary in Jerusalem, told Ynet, "There is a lot of value to learning the David Project curriculum. When you learn the facts in an environment that is pro-Israel and accepting, you are able to apply what you learned in other environments that are not as supportive of Israel". Next fall Nava will bring her leadership skills to the campus of Princeton University. The David Project Center for Jewish leadership is a non-profit organization committed to inspiring young voices on behalf of Israel through educational seminars, workshops and curricula. The program's Israel education curriculum, which is taught in North America and Israel, has been implemented in over 100 schools. MASA, the partner organization is responsible for long term student programs in Israel. While this was first shown a year ago, it is well worth reposting for those who may not have seen it before. After being paralyzed for the past 20 years, Radi Kaiof began to walk down a street in Israel to the sound of a dim mechanical hum. That was the sound of an electronic exoskeleton, developed by a small Israeli high-tech company, propelling the 41 year old paraplegic down the street with a proud expression on his face. The device, called ReWalk, is the brain child of engineer Amit Goffer, founder of Argo Medical Technologies. While ReWalk helps paraplegics, people paralyzed below the waist, to walk, stand and climb stairs, for Goffer, the device has a much more important impact on the user. Goffer himself was paralyzed in an accident in 1997, but he cannot use his own invention because he does not have full function of his arms. The product, slated for commercial sales in 2010, is not cheap. The company said it will cost as much as the more sophisticated wheelchairs on the market, which sell for about 20,000 U.S. dollars. The system consists of motorized leg supports, body sensors and a backpack containing a computerized control box and rechargeable batteries. The user picks a setting with a remote control wrist band - stand, sit, walk, descend or climb - and then leans forward, activating the body sensors and setting the robotic legs in motion. The ReWalk is now in clinical trials in Tel Aviv's Sheba Medical Centre and will soon be used in trials at the Moss Rehabilitation Research Institute in Pennsylvania. Goffer says his aim is not only to ease the lives of those strapped to wheelchairs but also to allow them to lead a 'normal' life. Yet for Radi Kaiof, who has not risen from his wheelchair for the past 20 years, the effects of ReWalk are not just normal, they are life-changing. The Land of Israel was given by God to the Jewish People. This gift of the holiest of lands brings with it great responsibility to fulfill God's word and to bring His light to the entire world. Throughout the centuries of exile, the Jewish People longed and prayed to return to the Holy Land as a holy nation. The Jewish People longed and prayed to return to the Holy Land. The Zionist movement, which founded the State of Israel, was the result of these centuries of longing. However, it was a product of the times and place in which it was born. It is based on secular, 19th century Western views and ideologies. Miraculously, the Zionist movement succeeded in building the complete infrastructure of a modern state - replete with a strong army, high tech, immigration and absorption out of the wilderness. In its very essence, though, modern Zionism negates holiness. God and Israel's Divine destiny were left out of the equation. The holy Torah was deemed totally irrelevant to the state of Israel. It was relegated to purely ceremonial status while Western standards and ideas dictate every significant facet of Israeli life. This secular orientation has stripped Israel of the tools necessary to reflect the Jewishness of the state and its ultimate holy purpose. The very Zionist ideology that built the modern state of Israel has now turned against itself as it seeks to purge itself of its Biblical roots and Divine purpose. This self-destructive bent is the ultimate conclusion of the secular ideology upon which Zionism is based. It also explains the zeal of Israeli governments -- both left and right -- to divest Israel of its heartland. "Peace" has become a euphemism for the desire to rid Israel of its Jewish identity. Modern Israel's obsession with international recognition derives from the very foundation of Zionism. Theodore Herzl saw international recognition as a cornerstone of the Zionist movement and as integral to Israel's declared purpose as a safe haven for the Jewish People. This explains the near fixation that the state of Israel still displays to this very day with international approval. Israel has been willing to do almost anything (relinquish vital land, release terrorists, evade pre-emptive strikes or even refrain from counter-attack) making many grave and costly concessions at the expense of the very lives of its citizens in order to achieve this elusive endorsement. Ironically, it is this obsessive desire for international approval that has seriously compromised the security of the residents of the "safe haven." In modern Western thought, nationalism is now passé. Modern countries of the "global village" are comprised of citizens from various cultures and places of origin. What binds them together is the mere fact that they all live in the same place, and eventually adopt a common language, and later, a common culture and history. This trend has also been adopted in modern day Israel. The momentum toward citizenship for all residents of Israel, regardless of their religion, is part of the Zionist ideology based on Western culture. If not checked, it will effectively transform Israel from a Jewish state to a state with some Jewish citizens. From "The Eye of the Storm"
During the tense and unpleasant times before Disengagement, especially after the Bayit Yehudi, Jewish Home, leaders were arrested and Moetzet YESHA Council took over, I became totally disenchanted with the "orange" leadership. At this point, it doesn't pay to go into detail, but certainly, if they had been competent Israel would still be sovereign and Jews would be living in Gush Katif. The struggle was waged so poorly, it made me wonder how seriously Moetzet YESHA wanted to win. 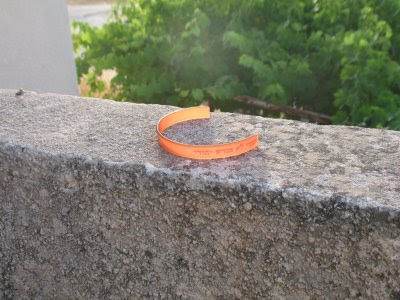 Regardless, just like I believe that we must support the IDF, the Israeli Army, despite its faults and we must support the State of Israel and fly its flag despite all the wrong it does, I keep an orange ribbon on my door and kept orange bracelet on my wrist. Over the years, the orange became dull, dark and dirty, and this week it finally broke and fell off. Yes, my wrist no longer proclaims/advertises my opposition to one of the most evil government decrees ever. The "orange leadership" never provided good leadership. Its monument is the Arab terror base where Jews once lived and thrived in Gush Katif. The DP's, evictees, are trying, despite their poverty and the apathy of the Israeli Government and most of the Jewish People, to rebuild their lives. There was never a mass movement for Jewish civil rights in Gush Katif, unlike the support for Jews in the Golan. That's why we're still in the Golan instead of it being a Syrian base for anti-Israeli terrorism, the way it was prior to the 1967 Six Days War. As was the case with Batya, my orange bracelet also broke this week and now resides on the shelf. However I personally never gave to or assumed that Moetzet Yesha was responsible to lead or win the struggle for Gush Katif. Many have suggested what could have been done yet did not step forward to lead when needed, others mastered the art of rhetoric which had no significance beyond self promotion. Also, until today, I have yet to abandon the Blue and White, for the Orange, perhaps a more, or the most significant reason the Golan remains today. I believe there is yet something to learn, that to move ahead we will need to act as a people, and not just as a sector. Our choice. Tucked away in a dilapidated, one-story building in the sprawling Sheba Hospital complex at Tel Hashomer, the headquarters of the nonprofit MILBAT organization are small and unassuming - especially considering the number of innovative products it churns out every year. Unlike companies who create, design and manufacture new products with the specific goal of making a profit, MILBAT has a different objective: to better the lives of physically and mentally disabled people and the elderly. Yael Shaked-Bregman, one of the relatively few salaried employees, greets me in the spacious entrance to tour the facility. A tall blonde with a smile that lights up her entire face, she shares her personal experiences over the last 14 years at MILBAT with the pride and passion of a dedicated professional who fully believes in the benefits of her work. One of about 20 therapists on staff, she arrived at the organization as a student of occupational therapy and never left. As we tour several rooms brimming with prototypes and sample products, it is clear that this is no ordinary organization. 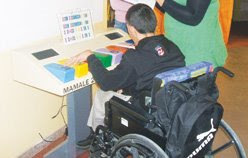 A wooden baby crib for mothers in wheelchairs has doors that open to the side instead of up; special computer keyboards are fitted with a metal grate to allow people with tremors to type; a remote control car for disabled children has giant plastic buttons; and an electric organ specially designed for the handicapped is fitted with large keys and colorful, round knobs so that it can be used as both a musical instrument and a therapeutic device. "If a solution to a problem already exists on the market, then we don't make it, but if someone has a special request for something that isn't already out there, we do our best to develop it for his unique needs," she says. One good example is a long lighter with a round piece of metal affixed at one end. "We made this for an elderly woman in Jerusalem who is visually impaired but wanted to continue to light the Shabbat candles herself," Shaked-Bregman says, showing me how the metal piece is designed to fit over the candle. "This way she doesn't have to see the candles to light them. She can feel them instead." When I grew up, got to meet and even strike up a friendship with my childhood idol Dosh (the late Kariel Gardosh), I asked him which, to his mind, was his most enduring political caricature. For that, he replied, we need to return to December 1956, approximately a month after the Sinai Campaign and the Soviet invasion of Hungary. Dosh noticed that while the international community was seething about Israel's feisty self-defense, it wasn't overly perturbed about the human rights and self-determination brazenly crushed beneath heavy military armor right in Central Europe. The hypocrisy, Dosh recalled, was hardly surprising but nevertheless galling, particularly the shamelessness of it. So he compressed it all into one frame. In the background a house labeled Hungary is going up in flames. In the foreground UN secretary-general Dag Hammarskjold, in firefighter gear, wields a hose labeled UN. But he's not dousing the blaze. He's drenching little Israel - Dosh's iconic sandal-clad Srulik - who stands soaked, angry and perplexed as he's subjected to more wet punishment. Dosh produced way more dramatic and memorable cartoons, but he estimated that the situation portrayed in this one would always stay topical. He predicted that Israel would always be the world's whipping boy, thrashed for the misdeeds of others and used for diversionary tactics. Instead of dealing with urgent crises and genuinely alarming dangers, the powers-that-be will rage at Israel to draw attention away from their own dereliction and cowardice. "The old czars," Dosh noted, "used to say, 'Beat the Jews and save Russia.' Today it's 'beat the Jews and save the world.'" He reckoned "this would stay true even when nobody remembers Hammarskjold." IF DOSH only knew how right he was. Today he'd probably have produced a very similar pen-and-ink commentary, but with Iran burning and Barack Obama extinguishing - Israel. The more things change, the more they stay the same. As pro-democracy demonstrators are killed in Teheran and as its ayatollahs further their designs to arm themselves with nukes, the leader of the free world harps on Israeli settlements. You can almost understand where he's coming from. Iran is a tough customer, and crazy too. It's tempting not to rile it and to deflect criticism by focusing on some lonely remote outposts in the middle of Judea and Samaria's barren moonscape. Not only isn't Israel scary like Iran, it'll broadmindedly collaborate in an effort to appease its detractors. How facile it therefore is to claim that peace and bliss on earth hinge on tearing down a few Jewish tents, rickety lean-tos, ramshackle sheds and decrepit trailers. It's true heroism to take them on in the guise of securing global propriety. It's plain to see that no greater peril plagues humanity - if we only avert our gaze from Iran, that is. Accordingly, to stress the need to downplay the Iranian fuss, Obama gave his people a lesson in moral relativism: "It's important to understand that, although there is amazing ferment taking place in Iran, the difference between Ahmadinejad and Mousavi in terms of their actual policies may not be as great as has been advertised." Not unexpectedly, Obama informed the unenlightened masses that he won't take sides:" I take a wait-and-see approach... It is not productive, given the history of US-Iranian relations, to be seen as meddling in Iranian elections." Of course it's one thing to entertain such notions, but quite another to broadcast them out loud. All sorts of perceptions may prevail in the Oval Office and shape policy, so long as they're not ballyhooed. Blabbermouth statecraft, however, is a bad idea. Noisy hype doesn't go unnoticed, especially not in the nuance-sensitive Mideast. Obama may arrogantly consider himself superclever, but his overtly declared nonintervention is equivalent to intervention. His error is eerily reminiscent of the series of egregious errors toward Teheran during the term of Jimmy Carter, the past-president most like Obama, though hardly as radical. IN HIS MEMOIRS, Ayatollah Khomeini's first foreign minister Ebrahim Yazdi writes that "the shah was doomed the minute Carter entered the White House." The novice president indiscreetly sent all the wrong signals, beginning with an exceedingly public cold-shoulder to the shah. The mullahs were heartened and exuded confidence. Increasingly shaken, Muhammad Reza Pahlavi sought to ingratiate himself to Carter by relaxing restrictions on opposition agitators. That further emboldened the religious fanatics and spawned unrest. Carter admonished the shah against quelling the disturbances by force. Willy-nilly, Carter's bungling was instrumental in installing a reactionary, repressive theocracy in Teheran. Under the banner of freedom, Carter helped the forces of medieval darkness. The shah was a goner and the ayatollahs repaid Carter by holding 52 American embassy staffers hostage for 444 days until he was replaced by Ronald Reagan. Carter's indisputable legacy was the bloodshed of the Iran-Iraq War, the carnage at the Buenos Aires Jewish Community Center and Israeli Embassy, the burgeoning of Hizbullah and Hamas, the co-option of Syria/Lebanon and Gaza into Iran's evil sphere, massive worldwide terror-mongering and lately nuclear ambitions and rhetoric about wiping Israel off the map. CARTER'S ENTIRE diplomatic energy reserves were misspent on pressuring Menachem Begin at Camp David, and quite ruthlessly. His latent anti-Semitism would finally manifest itself with the publication of his Palestine: Peace not Apartheid. His misguided liberalism in international affairs led Carter to bolster the worst despots in our time while lashing out at one of the most intrinsically democratic of societies anywhere - Israel. Unrepentant, same said Carter hobnobbed with Gaza's terror-kingpins last week and spuriously censured Israel for treating Gazans "more like animals than human beings... Never before in history has a large community been savaged by bombs and missiles and then deprived of the means to repair itself... This abuse must cease. The crimes must be investigated. The wall must be brought down, and the basic right of freedom must come to you," he told Hamastan's ayatollah-proxies, without a word about Israel's pullback from Gaza, the uprooting of 21 settlements and the atrocities that Gaza subsequently unleashed on Israel. Carter is Obama's mentor and Obama is the new Carter. Their motto is: In democracy's name be kind to democracy's most rabid enemies and be nasty to embattled democrats. Hence, while it's "not productive" for Obama to meddle in Iran, it's imperative he meddle in Israel. Deja vu. As in Carter's administration, a lopsided artificial balance must be struck in pseudo-sophisticated statesmanship. In other words, no matter where fires flare uncontrollably, the fire hoses will be aimed at Israel. This is why Dosh's nearly 53-year-old caricature remains ever-relevant - just as he predicted. Observation: Is Israel being sucked into repeat of the "dead soldiers for terrorists" swap? 22-day Israeli offensive against the Hamas-controlled territory in January. terrorist swap the Olmert administration made with Hezbollah? taking on faith that Shalit is still alive. they say Shalit may be dead? only in return for a live Israeli? There seems to be a crisis-overload. There's so much to worry about that the mind just sort of fogs over, and when the Sun is the enemy, well, you just can't escape! So I figured I'd go for a laugh. Did I get one out of you? Pallywood, "According to Palestinian Sources..."
Good ideas never die, they just get recycled. Hebron - Ma'an - An Israeli and a Palestinian woman were severely beaten? and between 15 and 24 Israeli activists were arrested as the group attempted to access Palestinian agricultural lands near the Bat Ayin settlement north of Hebron Saturday. The group had entered an area long declared a “closed military zone” after the nearby Israeli settlement expanded. The no-go zone is a buffer between the settlement fence and the Palestinian agricultural area. The attempted entrance into the closed zone was organized by Palestinian solidarity group ISM, which hired two Palestinian-Israeli's to drive vehicles into the West Bank so 35 solidarity activists could assist the local farmers in accessing their land. The suspected murderer of 13-year-old Bat Ayin resident Shlomo Nativ was arrested earlier this month by the Shin Bet (Israel Security Agency) and the IDF, it was announced on Sunday. Mousa Tiet allegedly infiltrated the settlement in Gush Etzion on April 2 while carrying a knife and an ax. He attacked Nativ with the knife and killed him. He then attacked and wounded seven-year-old Yair Gamliel with the ax. On April 14, the Shin Bet succeeded in locating and capturing the 26-year-old Tiet, a resident of Khirbet Tzafah, 2 km. south of Bat Ayin. 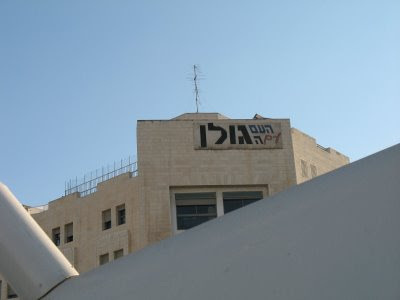 The Shin Bet said that during his interrogation, Tiet confessed and reenacted the attack for investigators, and revealed the location of the murder weapon, which he had hidden near the scene. Tiet told investigators he had planned and carried out the attack for "religious purposes" and in order to die a shahid, or martyr. He said he had purchased the weapons and hid them in a valley near Bat Ayin. On the morning of the attack, he collected them and infiltrated the settlement, first stabbing Nativ and then attacking Gamliel. He tried to attack a third child, who ran away. When residents tried to apprehend him, Tiet fled to his village. He told interrogators that he had destroyed some of the evidence and continued with his regular life out of the belief that he would not be captured. After decades of avoiding public exposure, the Israel Defense Forces's Medical Corps has realized that in the 21st century it should be getting its message out. The most prominent controversies involving soldiers' health in the past decade have been claims that Navy divers contracted cancer from training in Haifa's Kishon River despite its being polluted with heavy metals; plans for the construction of a large military training base near the Ramat Hovav chemical dumping site in the Negev; and clinical testing of anthrax vaccine on soldiers without their informed consent. And with the growing shortage of military physicians, public scrutiny and involvement of soldiers' parents, the Medical Corps has in the past year or two begun to let the sunlight in. Tat-Aluf Nachman Ash, the OC Medical Corps for almost two years, is behind its increasingly activist and open media policy. He recently invited medical correspondents to a briefing at the Tzrifin IDF base on what is new in the corps, and discussed trends and plans. THE BRIEFING was followed by an exercise in which IDF commandos wearing "war paint" stormed hideouts of "terrorists" in a simulated Palestinian village built inside the IDF base. Four Israeli soldiers were "wounded," and medics trained on the base appeared out of nowhere, assessing which of the "victims" required the most urgent help. The "victims" playing the part moaned and called for help, pierced plastic bags full of red liquid that simulated hemorrhaging, and wore makeup that made the "bullet wounds" so realistic that for a moment this reporter wanted to run onto the "battlefield" and offer first aid. But it was unnecessary. The medics pulled blue rubber gloves onto their hands, held bloody legs up to reduce hemorrhaging, bandaged the soldiers, opened airways with breathing tubes and slashed uniforms with a special cutter. When the exercise ended successfully, the "wounded" stood up in their underpants and happily posed with the medics and other soldiers. ASH, WHO earned his MD degree at Tel Aviv University's Sackler Medical School and specialized in internal medicine, noted that the Medical Corps is doing everything it can to bring the best emergency treatment to soldiers on the battlefield and to speed evacuation to hospitals. It has purchased high-quality foldable aluminum stretchers to keep soldiers with spinal injuries immobile; "smart" bandages that stop bleeding; developed a compact, portable device with ceramic pipes that produces oxygen in the field for treating the wounded, replacing heavy balloons that had to be carried; a thin blanket that when removed from a plastic bag turns warm in a chemical reaction; and a small battery-operated field device that ventilates the wounded on the battlefield and is so simple to operate that any medic can use it. 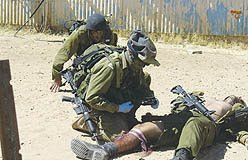 ANOTHER PROJECT being carried out with Core Dynamics, a Nes Ziona biotechnology company, is the development of freeze-dried blood processed from a pint of each soldier's blood at enlistment and then taken in a small bag to the battlefield to be reconstituted if he is wounded for immediate life-saving infusion. Ash said that wounded soldiers are now evacuated much more quickly, often undergoing blood transfusions and other procedures en route to the hospital. World renowned Moroccan singer Yosef "Jo" Amar passed away in New York on Friday. He was 79 years old. Amar was an Israeli icon during the early years of the state, a favorite of the newly arrived Sephardic immigrants. Amar immigrated to Israel in 1956. He pioneered the fusion of classical Jewish Sephardic and Arabic tunes with Western musical sensibilities, thereby helping give birth to the style labeled Mizrahi music today. The lyrics usually discussed the personal and social angst and joys of Middle Eastern immigrants who sought to find a place in Israeli society. 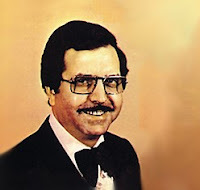 Amar was also a highly-regarded cantor. The casket of Amar, who recently joined his children in the United States, was brought to Israel Saturday night. His funeral will take place Sunday afternoon at Yad Rambam, the moshav where he stayed on visits to Israel in recent years. Amar made aliya in 1956, but later left Israel and divided his time between Europe and the United States. However, he continued to visit Israel to perform. After the death of his wife Remond, Amar returned to Israel. He was wheelchair-bound after having suffered a stroke in 2000, and two years ago, suffered a second stroke, which worsened the condition of his Parkinson's disease, from which he also suffered at a late age. Dr. Aaron Lerner - IMRA: OK. So anyone with an attention span beyond 20 seconds and a willingness to think beyond the next moment can understand the incredibly dangerous tinderbox that the proposal to create a sovereignty vacuum in Jerusalem is.One that could plunge the region into bloody war after an equally bloody war of attrition. Ehud Olmert as in Olmert-Sharon and the retreat from Gaza. a 20 second attention span and a 24 hour planning horizon. settlements. He's also proof of why Washington should try. operation would harm Olmert's ability to "function as a man." backroom deals, infuriating her Israeli counterparts. Following the debate from his recovery bed, Olmert must have felt betrayed. but my ideas are in power. And my ideas will prevail." Nations, European Union, Russian Federation, and the United States). joined by Quartet Representative Tony Blair. states based on the Arab Peace Initiative. concerned to take meaningful steps to support this objective. consistent support for the Palestinian Authority. Today, I thought it was appropriate to trot out the simple facts about the history of the foreign occupation of our eternal Holy City (which lasted until 1967). Time for a new ally?